Our customers love us for the end-to-end recruitment solution we offer. 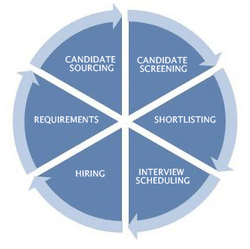 Right from screening the right candidate for a role all the way to on-boarding the candidate we manage the entire recruitment cycle. Since from the inception, we are succeeding in this business model with highest client satisfaction index and this one of our core businesses today. We are the best in understanding the requirements from the client and we can deliver the same by going beyond the expectations of the client. We are the proffered vendors for many of our clients.